One of the largest and the widest known business networks is LinkedIn. Just like other networking sites, the basic work of LinkedIn is to connect like-minded people. However, it is mainly used by professionals or business executives to increase their networks and get in touch with people with a vast knowledge in the area which they are looking for. The business contacts in LinkedIn help not only the people who are seeking for jobs but also the employers who are looking for the perfect candidates that they wish to hire for a job. A profile on LinkedIn has all the necessary information required for a person to know his professional background. Mentioned below are the ways in which a person can find recruiters on LinkedIn. How to Connect with Recruiters on LinkedIn? 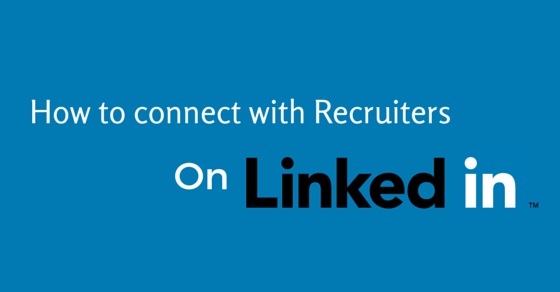 The following mentioned are few LinkedIn tips on how to connect on LinkedIn and ways for using LinkedIn to find a job. The first task of any individual who wants to connect with the job recruiters is to find the recruiters in their own field. LinkedIn is a field in which a large proximity of professionals has their profiles and hence it is vast and varied. To find the recruiters who are not only in your field but also willing to connect with unknown professionals is a task. For this, the Advance LinkedIn People search function is useful, as it helps in connecting with the people in your profession and knows exactly the best of them with the help of the Advance search option. The search option also allows the user to specify the company name, location, job title and other useful location for better and refined results. With all these features, it is easy to locate the exact recruiters which a candidate is looking for. LinkedIn accounts like every account on the social networking sites is visible to the world. Before sending a contact request to the LinkedIn recruiters account, it is very important to make sure that your LinkedIn account is up to date and does not have any errors or typos. Also, make sure that it is complete and has all the latest information about you. Since your account will be a virtual image of you, it needs to have a professional edge to make the employment recruiters accept your request. Quality control of the profile on LinkedIn is as important as sending an introductory message as it helps the professional recruiters in knowing about your interests and profession. While a person uses the Advance Search Option, it is necessary to use the appropriate keywords in the text box. With the help of appropriate keywords it is easy for the search engine to optimize the search and find the necessary recruiters in a minimal amount of time. For e.g. one should type ‘recruiter healthcare’ if a person is looking for a recruiter in the healthcare industry or ‘recruiter technology’ if a person is looking for a recruiter in the technological sector. With the use of appropriate keywords, it is easy for the search engine to understand what exactly the candidate is looking for and is able to provide the exact information that is expected. A person can also refine the keywords according to what exactly is he looking for and depending upon the field of work. Anyone and everyone can, on LinkedIn connect with a recruiter, but the candidates hardly think if they can actually make the life of the recruiter easier if at all they manage to bag the position that they have been looking for. One question that every candidate should ask themselves is how and what can they do to make the life of the recruiter easier. And after having a sure short answer to that make sure you explain it as briefly and specifically as possible to the recruiter. A recruiter shall recruit a candidate only if he thinks that he shall be worth hiring. So give him a reason to connect on LinkedIn with you as the only reason for them to connect is if they can add value to their profile or their business. So ask this question to yourself and it may help you get where you want to be. Just like while sending a resume, a person sends an introductory message which is brief but to the point about what exactly is he and what is he looking for. Exactly like that, the candidate who wants to connect with a recruiter on LinkedIn is expected to send an introductory message. The purpose of the message is that the person or the recruiter on the other end should know that you are genuinely interested in developing contact with them on the business lines. In the message, a candidate can inform the recruiter about the purpose of his contact and also mention about his work profile and minor details. Since most social networking sites do not provide filters to remove spammers, without a message, it is possible that the recruiter may think of the candidate as a spam and not accept the invitation of contact. The most important thing about the introductory message is being specific. Do not use jargons and make sure you mention the reason for your connection and also a brief about who you are and your interests. The introduction needs to be neither too short nor too long as if it is too long, it may end up being ignored by the recruiters and a too short is likely to not being taken seriously. Being specific also refers to making the recruiter see why accepting your contact and connecting with you will be beneficial in the future. No top executive recruiters of the company would be interested in people who are vain or unprofessional. Hence, it is very much important to be specific and make the recruiter realize that you will be a good connection. Moreover, it is necessary to proofread your message as grammatically incorrect lines or types are the biggest screw ups which scream unprofessional. It is important to make a good first impression on the career recruiters. After the recruiters have accepted your request and taken into consideration your objectives, it is important to maintain the contact in order to stay within the reach of the recruiters. Since the recruiters may be getting a lot of connect requests it is easy for them to forget you, hence it is important to maintain contact with the recruiters in order to be in their mind in case of any requirements that their company may have in the future. The best way to maintain contact with the recruiters is to send them a note just like the introduction once per month. This shall help you to stay in contact as well as remind them about the skills that you possess which might be helpful to them in the future. Hence, maintaining contact is an important way of making sure that the recruiters do not forget you and may also help you bag a position which you wanted to get. LinkedIn as a business networking and a social networking site has helped a lot of people who are looking for recruiters and other business professionals. It helps people from various businesses connect and build their company or themselves. However, using appropriate ways to connect is necessary to get the desired networks and opportunities. Like every social networking site, LinkedIn too has many pros and cons but it is necessary to make the best of what one gets and not use it for wrong means. Previous articleHow to Overcome Performance Appraisal Problems? Next articleIntroverts at Work – How to Work with Introverts in the Office?